If there's one thing obvious about Peter Berg it's that he has the utmost respect for our servicemen and women, and even in the ridiculous flop Battleship you can tell he wants to do them proper justice. While there's a certain over-the-top patriotism present in most movies about the military, Berg has found it difficult to blend with his Hollywood "shock and awe" style of filmmaking. The true story behind Lone Survivor is one of heroism, brotherhood, and sacrifice, and the film is undoubtedly a visceral powerhouse of raw emotion captured in full glory. Berg can't let that be enough, though, and his tendency to "blockbuster-ize" everything saps some of the inherent drama of a harrowing real-life ordeal. 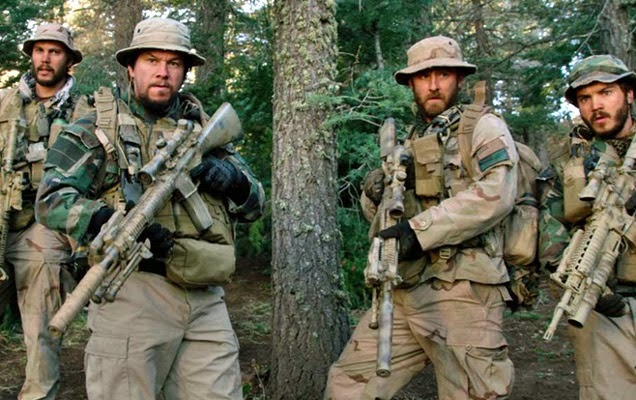 Unlike the similar but ridiculously cartoonish Act of Valor, Lone Survivor's reverence for Navy SEALs seems sincere, beginning with documentary-style montage of the extreme conditions each goes through from boot camp on, a stark reminder that they are meant to be the elite. Those who survive, and it really is a fight for survival right from the beginning, form a kinship forged in blood and sweat. Berg takes that idea to heart in his depictions of Seal Team 10, including Marcus Luttrell (Mark Wahlberg), Lt. Michael Murphy (Taylor Kitsch), Danny P. Dietz (Emile Hirsch), and Matthew Axelson (Ben Foster). We're breezed through snapshots of their personal lives; one is getting married, and his colleagues ruminate confusedly about women and what it takes to keep them happy. Murphy's wife wants a really expensive horse he can't afford, while Luttrell wonders if a hot bridesmaid will be at the wedding. "She's a bridesmaid", Murphy banters back sharply. An earnest newbie recruit (Alexander Ludwig) is in the midst of rookie hazing, while others race around the barracks in an obvious test of manhood. Subtlety isn't Berg's strength and it evaporates pretty early on. While their personal lives are sketched pretty thin, it's enough to establish the camaraderie and clue us in to the machismo pecking order, which surprisingly doesn't have Wahlberg's character at the top. Instead it's Kitsch who emerges early on as the muscle and the level-headed one of the group, leading his men into a doomed mission in Afghanistan to kill Taliban leader Ahmad Shah. The mission chronicled is Operation Red Wings, detailed in Luttrell's book Lone Survivor, and this is one instance where the title can be taken at face value. And since it's Wahlberg's mug adorning all of the movie posters, it's safe to say he's the one who'll be walking away from the upcoming firefight. Right away the mission gets off to a rough start due to the rocky, mountainous terrain and the poor communications. Early on one of the four soldiers remarks there are "a lot of moving parts" to what should be a simple hit-and-run op. Things turn instantly dangerous when locals stumble upon them, and the men are forced to make a quick decision. Do they kill the locals and maintain their cover? Or do they set them free and risk exposure to the Taliban? The argument that follows is rational and impassioned, with no easy answers to be found. Taking charge, Murphy decides to let them go, and within minutes they are surrounded by more than a hundred armed Taliban fighters. Escape isn't really an option. All they can do is fight and pray rescue shows up in time. And the firefight that ensues is truly something to behold, not that it's exactly enjoyable, but because it's so brutal that it's tough to look at without wincing. It wouldn't be so bad if these men endured a quick, bullet-riddled demise; this is death by degrees in which the greatest threat doesn't come at the end of a gun. Instead it's Mother Nature posing the greatest obstacle, with the trees and rocks forming a jagged tag team of destruction, picking the men apart as they tumble and crash from one cliff to the next. These are some of the most intense war scenes ever depicted on screen, and there never seems to be an end to it. For nearly an hour we're forced to watch these men face overwhelming odds with bravery and an unflappable sense of duty, protecting one another like brothers in every sense of the word. Berg doesn't trust in their courage to be enough, though, glorifying in the chaos and sickening sounds of bodies cracking against the rocks. He just can't help himself from turning a truly heroic, noble act into just another action movie. While Berg largely avoids any philosophizing on the necessity of our presence in Afghanistan, his one-note depictions of Shah and the Pashtun people speaks volumes. But it's also to his credit that he's able to keep the suspense at a high level despite our knowing how tragic it all turns out and one could say that actually makes their slow demise tougher to endure. While the four leading performances are better collectively, there are a couple of individual stand-outs. Kitsch has never been more charismatic than he is here, showing a maturity that was sorely lacking in his previous efforts. He gets the film's defining moment, a momentous act of self-sacrifice that reverberates right up until the end, and perhaps this is Berg doing him a favor for that whole Battleship fiasco. It's probably no surprise to learn that Foster finds layers of complexity in the passionate Axelson, while Wahlberg is in full "everyman" mode here. Poor Emile Hirsch is basically left carrying everybody else's luggage, and Eric Bana frustratingly spends most of his time on the telephone. The film ends with one final show of respect, honoring the 19 soldiers who perished during Operation Red Wings. Despite Berg's painting in broad strokes and reveling in the violence too much, Lone Survivor is itself a glowing tribute to the drive, determination, and spirit of our armed forces.